Crystal Windham is the automaker's new leader of North American passenger car design. 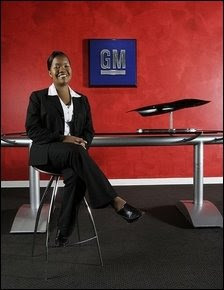 General Motors Corp. named its first African-American female director of North American passenger car design Thursday. Crystal Windham, 35, a lead designer of the award-winning Chevrolet Malibu, will oversee interior design of GM's global midsize, compact and small cars. During her 14-year GM career, Windham has worked on assignments across several brand studios, including Adam Opel, the automaker's German subsidiary, from 1997-1998. Four years later, she was named design manager of interiors and worked on vehicles including the 2008 Malibu and 2007 Saturn Aura, and later managed design of advanced exteriors for full-size trucks. The promotion is significant considering the auto industry has been slow to promote women and minorities to top jobs, said Marcela Fink, executive vice president of the Women's Automotive Association International, a Detroit-based nonprofit group. "That's just fantastic. We're finally starting to catch up," Fink said Thursday. "It says a lot for our industry, to be able to make it in this industry, it's hard for women." Windham is another high-profile minority appointment at GM. In 2003, Ed Welburn became the automaker's first African American design leader. "As an interior designer, I create solutions and appealing spaces for customers," Windham said in a statement. "As a leader it's my job to foster creativity and ensure that creativity is represented in the final product. Our design vision, intent and integrity led us to create the best interiors in GM's history." The promotion comes 18 months after Windham was named design manager of exteriors. She has a bachelor's degree in industrial design from the College for Creative Studies and a master's degree in business administration from the University of Detroit-Mercy. "A mentor guided me toward automotive design. Without guidance and support from family and co-workers, I wouldn't be where I am today," she said. "I truly love my job -- it's creative, expressive -- but it is not easy. Enjoying what you do, however, makes it all worthwhile. I hope other young women will look to what I have done and be inspired to consider automotive design." We still have a lot to overcome with all these first's still occurring for African Americans.